As you’re putting down your third portion of turkey and ready to move on to the pecan pie today, you may for a moment reflect on the things for which you are thankful. At Beantown Baggers we want to remind you that there is definitely a top 10 list that should come to mind for all of us. 1. 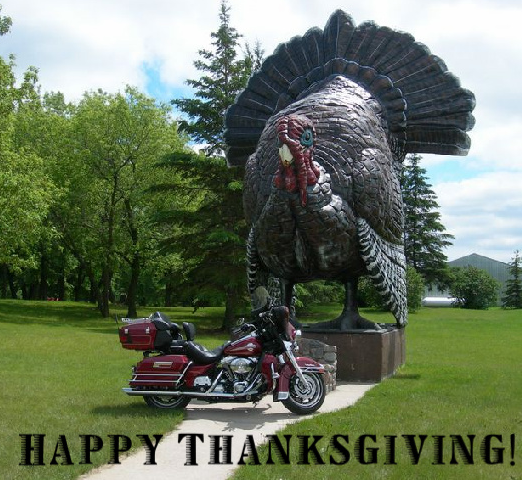 We are thankful for big V-twins that tell the world that we’re on the way… a mile before we get there. 2. Saddlebags to carry warm gear and help us avoid buying destination sweatshirts in Newport or at the old Cuffy’s in Yarmouth. 3. Women who dig bikers and accept our varying levels of insanity. 4. Paint jobs and tattoos that help us express our individuality and creativeness… without having to look like a douche at an art gallery. 5. The fact that Harley Davidson, Indian and Victory are awesome American brands with storied histories worth continuing. 6. Side roads that are undiscovered by cagers who slab it for convenience (leaving the best roads for us). 7. The fact that Sturgis happens every year – and it’s in August! 8. That the un-ridable chopper trend has come and gone. 9. That America has some of the best riding in the world and yes, I CAN get there from here! 10. We are thankful for our families, our friends and our freedoms. This is a day when we can relax, eat great food, watch football and be happy that we can simply be happy. This is worth more than any cams, pipes or breathers that money could buy.